The N95 is a phone that’s everything you want it to be. Although , more than anything else, it’s a smartphone that’s smarter than the rest. 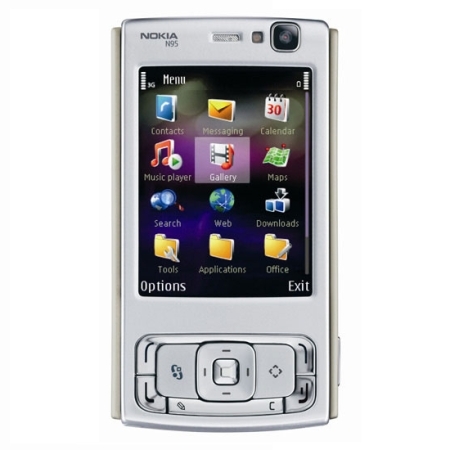 While operating on a Symbian operating system, this smartphone has exclusive and unique features that defy the mobile world. Swiftly store all types of media on the 160 MB built in memory. The display is a 24-bit Color TFT LCD that outputs 16.7M brilliant colors. The easy to use keyboard lets you send text messages with ease. Bluetooth Wireless Technology lets you send and receive media through a wireless connection to and from friends and family. You can even surf the world wide web with a simple Wi-Fi connection. Special features include GSM, Cellular Phone, MPEG-4 Video Player and EDGE. Expand your memory by inserting a MicroSD card into the expansion slot. The cell phone has virtually universal bands including GSM 850, GSM 900, GSM 1800, GSM 1900, EGSM 900, WCDMA and HSDPA. The cell phones also has cool features including MMS, SMS, Hands Free Options and Speed Dial Buttons. The camera has a built in music player to play all your MP3 and WMA files. The build in digital camera has amazing quality. It has a resolution of 5 Megapixels, which is awesome for a camera phone, and an unbelievable 10x Digital Zoom. Video Capture Capability allows you to take cool videos while on the go. Wireless capabilities include WLAN 802.11b, WLAN 802.11g and Bluetooth. The Proprietary Li-Ion battery lasts for 4 Hours when fully charged. This phone has a height of 4 inches and a weight of 4.23 oz. From a Gadget Addicts perspective, this new phone has outstanding capabilities, that any multitasking person could ask for. Experience a gadget with a massive amount of features including Carl Zeiss optics and multimedia computing. The second everyone heard about the release of this extraordinary phone, millions wanted to get there hands on one. When released, hundreds of people were willing to pay thousands to have the phone the second it hit the market. Even now, months after it’s official release, the iPhone is still hard to find. Although many online stores have it in stock, many others do not. This phone has sleek features that make this one unique device. Starting with the 3.5 inch widescreen display, which also happens to be a touchscreen. This interface gives you touch controls and easier maneuverability. Simply dial a phone number with a few finger strokes, and text message with ease. The phone operates on a Mac OS X, just for all those Mac lovers. This specific device has an installed memory of 16 GB, although it is also available in 8GB also. This gives you enough space to put all your favorite songs, movies and games in to this phone. A phone which holds this amount of multimedia is unconceivable, even to the most up to date gadgeteer. The PDa has special features include Vibration Notification, Vertical And Horizontal Display, Sound Notification, Security Password, MPEG-4 Video Player and Speakerphone. It also has versatile cell phone bands including GSM 850, GSM 900, GSM 1800 and GSM 1900. 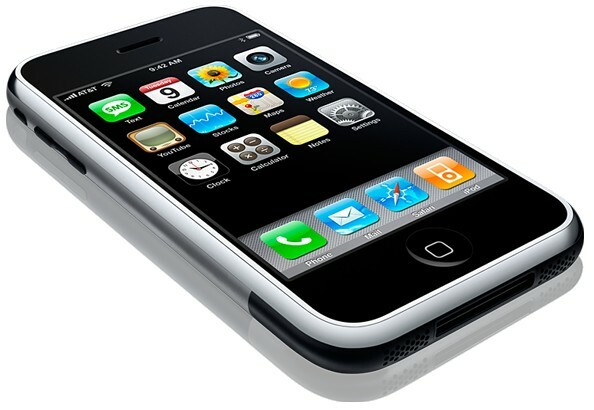 Your cell phone will have a talk time of 8 hours and also features SMS and Hands Free Options. There is even a built in digital camera which has a resolution of 2 Megapixels. Your wireless capabilities will include WLAN 802.11b, WLAN 802.11a, WLAN 802.11g and Bluetooth. A 1 year warranty is also included with the iPhone. From a Gadget Addicts perspective, this device has a versatile interface, allowing you to perform different types of multimedia activities from one compact device. Just make sure to treat it carefully, you paid a lot for it, so it will surely cost a lot to repair.